Banjo is an old farm dog and Ruby Red is a haughty chicken, and they never see eye to eye. Can they ever be friends? A funny and touching story of antagonism and love. Old Banjo is the best chook dog we’ve ever had. Banjo is a farm dog who is hard-working, fun-loving and loyal. One day, as he is rounding up the chickens as usual, he notices that his favourite hen Ruby Red is missing. Banjo searches all over the farm and eventually finds his friend, who is gravely ill and requires his special care. 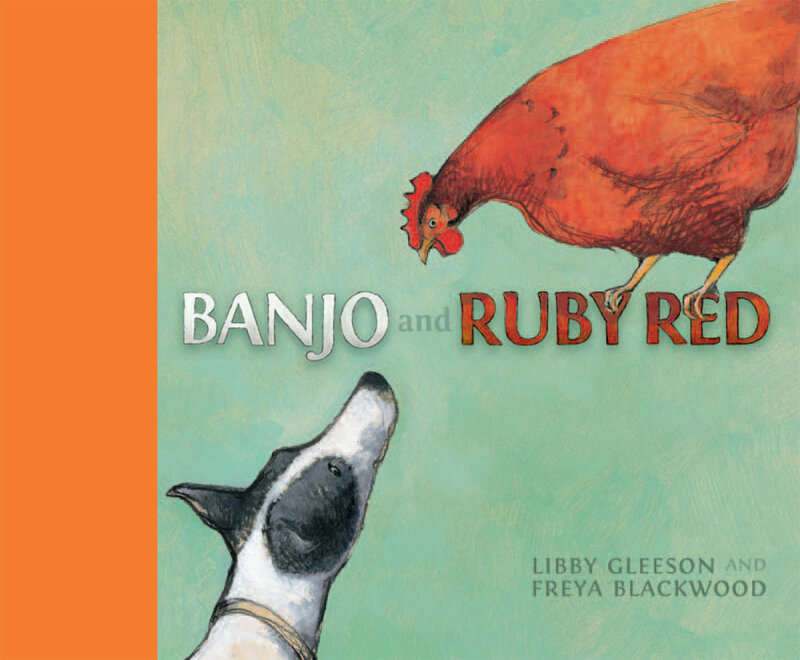 Libby Gleeson does not shy away from the realities of life on the farm, and despite Banjo’s attention, there is a point in the story where it is not clear if Ruby Red will survive. However, the realistic edge of the storyline is balanced by the sense of warmth and love between the animals on the farm. Freya Blackwood has taken great care with her depiction of the characters through lively and emotive illustrations. The chickens almost leap off the page at the reader! Booksellers, libraries and schools will find this book a great addition to their shelves. Banjo and Ruby Red is a beautiful story of friendship, hope and love that will be enjoyed by all children aged three and up. Around the wood heap goes Banjo. There’s a post about my work process and some experiments I undertook when working on this book on my blog here.